Notes: Designed for use in cable operated applications using Sniper EFI intakes only. Recommended for use with Holley IAC sensor 543-105 and TPS sensor 870001. With Holley Sniper throttle bodies, Holley engineers went back to the drawing board to build the ultimate air valve for your engine! They feature enlarged bore sizes, allowing for increased airflow to support your higher horsepower needs. A progressive throttle pulley enhances low-speed drivability, and a double return spring provides solid and secure throttle control feel. These units are maximized for your application, with a 4-bolt style mounting pattern; most models include bolts and gaskets. 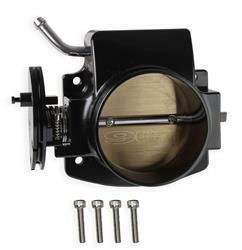 Order the throttle body designed for fitment with your year/make and engine family. I do not know if this throttle body will bolt onto an Edelbrock cross Ram intake, This throttle body utilizes a standard GM LS 4-bolt pattern.